Boasting spectacular beachfront views and a relaxing tropical atmosphere, the Best Western Jaco Beach All-Inclusive resort is in the center of it all, thanks to its prime location on Pastor Diaz Avenue. This all-inclusive resort provides guests with unlimited food and drinks as you gaze out over the Pacific Ocean, as well as exciting activities for all ages, outdoor swimming pools and tennis and volleyball courts. The 125 guest rooms offer comfort and convenience that are equipped with free Wi-Fi, cable TVs with free movie channels, air conditioning and a work area. Its prime location gives you the option to sit poolside while sipping refreshing cocktails, or conveniently stroll into Jaco's entertainment and shopping districts to get a taste of the local Costa Rican culture. 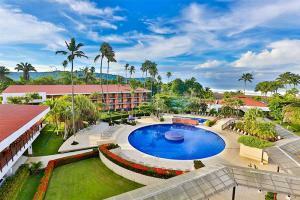 The resort is about 40 miles from San Jose airport, and a 10 minute walk to Jaco Beach.